Stepping outside my house this morning, you wouldn’t have known anything had changed. It’s January 1st – another day, a different year. The same snow from 2015 still coats bare branches against pink skies, and yet, it was different. Today marked the beginning of something; that intangible something that signifies a clean slate. The starting line. Today was the chance to form new goals and new dreams. This morning, I feel inspired, like I could take on any challenge placed before me – and I hope you feel that way, too. There is so much I want to accomplish this year, from repainting my bedroom to crocheting a cozy afghan for the living room. Aside from the usual goals of losing weight and getting organized, though, I want to challenge you to set goals outside of the stereotypical. What about a goal to see your friends more? 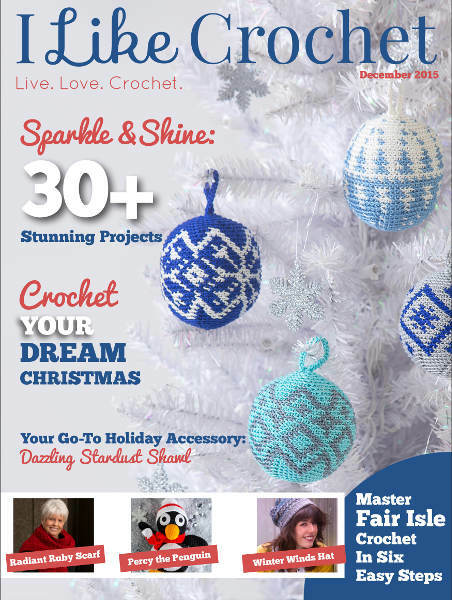 Or another goal to take some time to crochet handmade gifts for each of your family and friends? How about finally setting aside the time to volunteer for your favorite local charity? The new year provides the perfect opportunity to make all of these goals a reality. Let 2016 be the year of the new you! Of course, what’s a new year without a new collection of projects to keep you inspired? 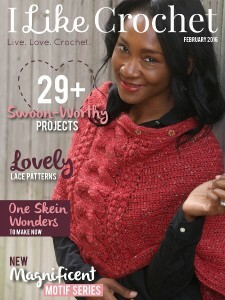 Within this winter issue we’ve included some of my favorite patterns to date. From the elegant and colorful Indigo Sunset Shawl to the vibrant Sweethearts Afghan, you’ll have no problem filling up your crochet to-do list.